What is my chance of hair loss? For whom is scalp cooling a good fit? How well is scalp cooling tolerated? What is my chance of hair loss with scalp cooling? Preparing for hair loss makes it more bearable. Patients prepare themselves in different ways: by reading about it, choosing a wig, trying out different head coverings, talking with others in the same situation and so forth. Think about whether you want to cover your bald head. When you are bald, everyone around you sees that you are sick. Baldness and cancer are very closely associated with each other for the outside world. It is good to know that outsiders usually do not see that you are wearing a wig. The loss of eyelashes and eyebrows also often goes unnoticed. Patients say that they worried far too much about it and that they quickly gained more self-confidence due to the positive experiences. If you are not able to go to a hairdresser (stylist), then request a home visit. A beauty specialist can also come to your home to give you make-up tips for camouflaging the loss of eyelashes and eyebrows. Patients report that taking pictures of hair loss helped them in processing it after the treatment. Visit the ‘Look Good, Feel Better’ (www.lookgoodfeelbetter.org) website, or use the application for a virtual make over. When do I go to the stylist? It is advised that you think before the start of the chemotherapy about any wig or other head covering. Try out various models. If you choose a wig, then visit a stylist before the hair loss begins, so that your wig can best match your own hairstyle. It can also happen, though, that you feel better with a different hairstyle. If you choose scalp cooling, then you do not know in advance whether it will have the desired results for you. Many patients have reported that they needlessly purchased a wig and thus incurred unnecessary expenses. The recommendation is to choose the wig before the chemotherapy begins. In some countries, a wig can be reserved for a small fee, and if the scalp cooling is successful, the wig does not have to be purchased. Can it help me to cut my hair short or shave it off before the chemotherapy? 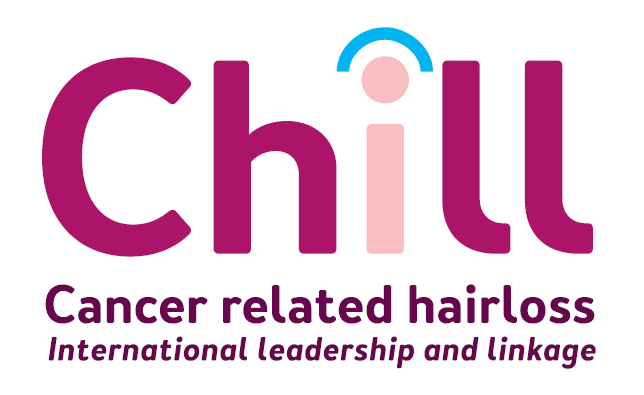 Shaving the hair has no influence on its growth during or after the chemotherapy. When the hair does not fall out completely, longer hair can be used to camouflage any bald spots. When the hair is not shaved off, you will have a fuller head of hair sooner when the hair starts growing again. Short hair often looks fuller than long hair. Cutting the hair short makes the transition to a wig less drastic if there is hair loss. Shaving the hair stops the patient from being confronted with hair loss throughout the day (on the pillow, in the shower drain, on clothing). The wig can also be secured more easily. Patients have reported that shaving the hair gave them a ‘sense of control’. Patients have reported that it is difficult for them to shave off their own hair with clippers. If you have serious hair loss and do not want someone else to remove your hair, you can wash your hair several times. Loose hair will then be removed. You will gain insight into your chance of serious hair loss, with or without scalp cooling. After that, you will be asked for your opinions in a brief questionnaire. You will then not be given a recommendation for your choice, but an overview of your preferences with respect to hair loss and scalp cooling..